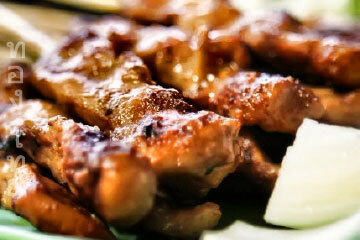 3. and the sweet & sour dipping sauce known as Nam Jim Satay. To eat take a piece of meat, add some Satay sauce and a little Nam Jim on the spoon. Each element provides striking contrast in terms of flavour and texture (typically Thai) but when combined the result is truly delicious. Some Thai Gold Coconut Milk for brushing the meat. Marinate the meat slices with all the ingredients for about 30 minutes (60 minutes for beef) and then skewer. Cook on a medium heat barbecue, brushing with coconut milk frequently (repeat until cooked). Just heat the jar content. Mix vinegar, salt and sugar and stir until the salt and sugar dissolve. Serve in a side bowl. You'll need: Wooden skewers soaked in water for about 30 minutes.